We launched our Reimagined department with toasters. 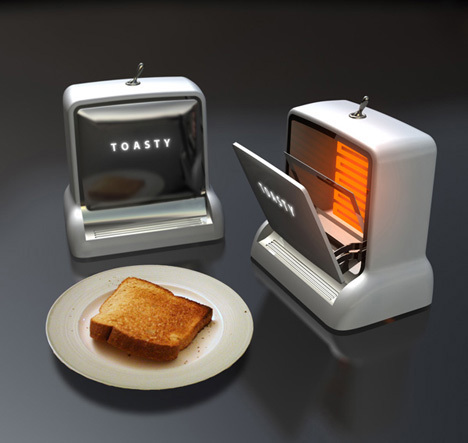 Here are some more imaginative toasters compiled by Yanko Design. Some of them are ones we’ve already covered and others are new. A kitchen appliance that has been taken for granted for such a long while is the humble toaster. 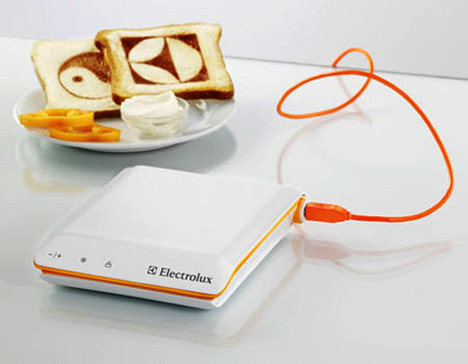 So ignorant are we of its origins that till now it is unknown who invented the first electric bread toaster! No doubt evolved humans have been toasting a slice of bread for a long time now, but almost two centuries ago the deed was done over an open flame. The failed attempt of Crompton & Company in 1893 to commercialize it as Eclipse, led to General Electric’s D-12 claiming the title as the “first commercially successful electric toaster” in 1909. As the design process progressed from metal frames over fire to a sophisticated domestic device, the appliance saw itself on the shelf as three iterations: the Pop-Up, the Oven and the Conveyor Toaster. Here is a look at some inspirational designs that plan to revolutionize the browning element of our lives. Incorporating the Jet design into cars and bikes is passé; lets hitch it to a toaster and see how fast the bread burns! My guess is that this was the thought process behind this monster-toaster. No conformations, but a unique design. Technically this isn’t even a toaster, but imagine if your toaster could charge your gadgets while crisping the breads, wouldn’t that be fun! 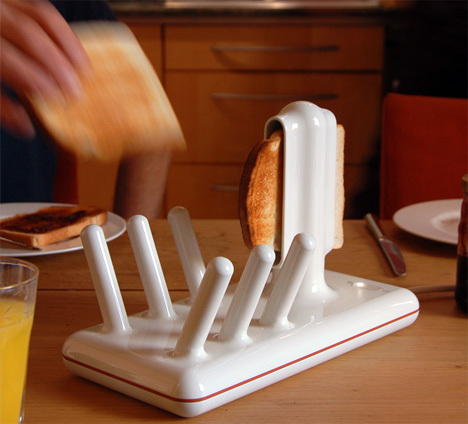 Adding a spectacle to the breakfast ritual of two pieces of toast with jam is this Glide. It artistically slides out the toast from a porcelain mold, adding much drama to the slice-holding bay. 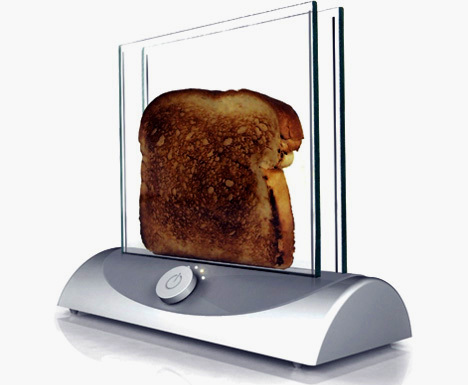 Adding visual appeal to “what you see is what you get”, the Transparent Toaster expects you to enjoy the perfect brown color thanks to the glass element. Of course the technology of getting the glass hot enough is still nascent, but it would be a splendid idea to enjoy perfect crispness! 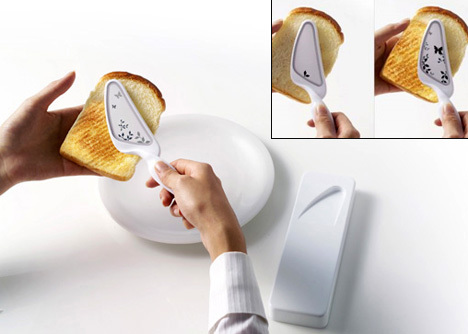 Slide the toast straight to your plate! 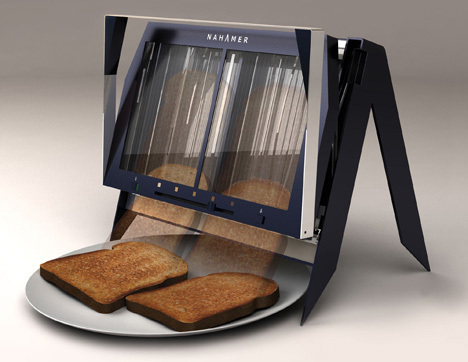 Besides doing this, the Nahamer T450 touts itself as the first environmentally sustainable toaster. It can be dismantled at end of its journey of browning breads and probably be recycled. 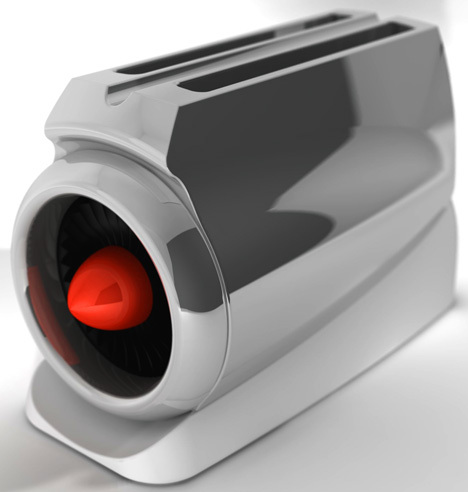 It crisps the bread faster (by 20%) while using half the usual amount of energy required. Best of all, the transparent shield allows you to see how the toasts are doing. 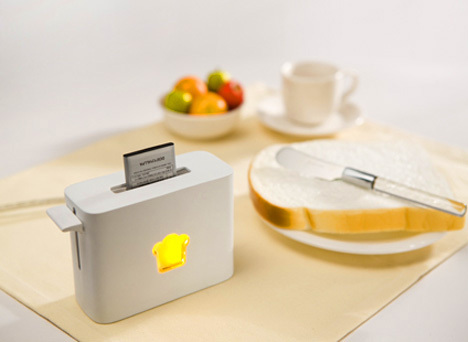 Get your daily news imprinted onto your toast; that’s what this scan toaster does. Hook it to a PC via USB and download what you want to read on your bread and then munch it! I would use it to probably scorch a love ode for my partner, what would you download on your bread? Got Vegas in your blood, how about rolling the dice one last time? This time the gamble is on the number burnt onto your toast. 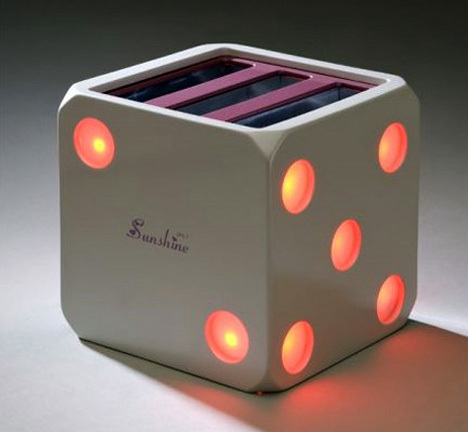 Random numbers from the dice get singed onto the bread…I bet it’s a six …shoot, it’s not; lets roll the dice again! The world is full of married people, as Jackie Collins would like us to believe, so why do singles need a big 4-toaster appliance? Toasty Single Serving Toaster should suffice, anyways you’re on a diet, and hence one slice will do. The retro look ups the likey quotient. 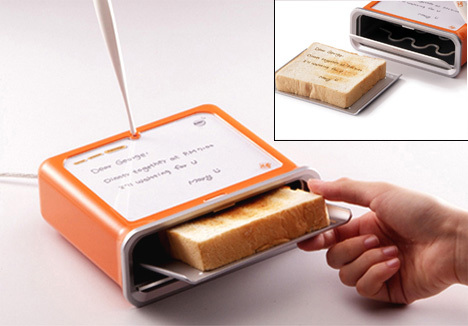 The new age Post-it or progressive toaster design, call it what you want, but I simply LOVE this concept. Just pen down your note on the message board (on top the toaster) and then see it etched onto the toast. Eat your words buddy! The dainty butterflies that you see on this ceramic knife actually represent the heat-strength of this Portable Toaster. Like you spread butter with a knife, glide this toaster over the bread and see it transform from white to brown. Previous articleLFTP: What the hell is going on with kontaktmag?